Pin It Now! It's been such a big issue how South Korean Actress, Lee Dae Hae made fun of Filipino teachers by imitating one in a Korean Show. The video on youtube has been taken off by KBS as soon as Filipinos started leaving comments. I'm not a big fan of Lee Dae Hae. I wasn't a big fan of her series My Girl either. 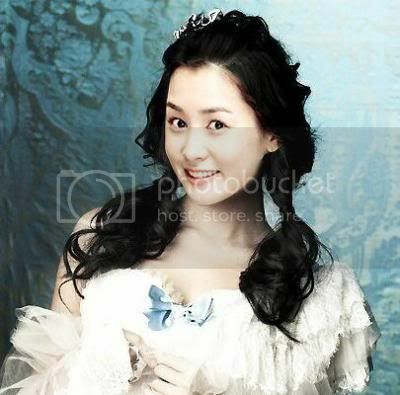 I loved her in Green Rose and thought that she is really pretty and sweet but got a bit over-the-top in My Girl. I'm sorry, but I'm not really a big fan of the series as well as the Filipino adaption of it and it has nothing to do with either actresses. Though Green Rose is a favorite of mine, it is because of Ko /Go Soo and the plot At first ,I got a bit stung after watching her video and felt bad especially that my sister is a tutor to Korean students. If indeed she was/they were making fun of how Filipino teachers pronounce words then this could actually damage our image. Furthermore, this won't only affect Filipinos but also Koreans who can't afford to go and learn English in Australia, UK and the US and have to settle for cheaper Philippine English Education. It's like throwing a ball so hard onto the ground that it bounces back hitting you right in your face. I remember a Korean Teacher told his confused student who went to study here in the Philippines and found it difficult to understand why there are always exceptions in certain grammar rules that she followed strictly that it caused her to contradict some teachings from her Filipino Teacher, He told her that "Filipinos learn English as if it's natural to them that's why it's not difficult for them to know these exceptions from rules because it simply does not sound right to them once they hear it." In my early years, English was my worst subject (though my grades were relatively high, it was my lowest). I get to participate in Mathematics contests as well Science Contests but never any Speed Reading and Comprehension nor Spelling contests. I became better when I started to read books. I became a bookworm and it made my English better that I was able to get good grades in English in the later years of my Gradeschool Life which eventually became my favorite subject. Even if I do get good grades in English, I admit that even now, I still do commit grammar blunders from time to time. Recently, I have gone back to school to get some units in English. One of the most difficult subjects I have is Phonetics. If there's one important thing I have learned is that you cannot always expect anyone to pronounce words according to IPA standard. Koreans for example have difficulty pronouncing /g/ and often pronounces it as if it sounds /k/. It is also common for Filipinos to interchange /f/ and /p/. Another example is when a Japanese finds is difficult to pronounce /r/ which we can call dehortacization. I cannot explain everything in this blog but it would be helpful to anyone interested to learn Phonotactics which is a branch of Phonology that deals with restrictions in a language on the permissible combination of phonemes or learn Phonology. and not a fixed repertoire. Bashing someone for mispronouncing English words isn't new to us. We do it all the time and not only are we doing it to foreigners but also to our own countrymen most especially to those from the Visayas and Mindanao area. We have comedians imitate Indian and Chinese accents and we laugh at these comedians then why do we get so hurt when LDH didn't even mention that she was imitating Philippine accent (although the host did mention Philippines and the idiotic editor flashed our flag on the screen) specifically? If it was indeed an imitation of someone from Southeast Asia how come other countries from this region did not react strongly to this? Hmmmm...Now maybe we learn how it feels like to be made fun of in something we consider we are superior at. I think that we should just forget about this issue and move on. LDH had made an apology. This should be a challenge to us to improve our English better and not to rest on our laurels because maybe one day, we'd wake up and we are not the better ones-only to be outdone by those whom we thought in the past which would be tragic. My blog entry might not make that much sense or it does look like my thought are a bit here-and-there but I just have to write my thoughts even if my eyes are begging me to go to sleep. This is a form of self-discipline because I might wake up tomorrow and be lazy.